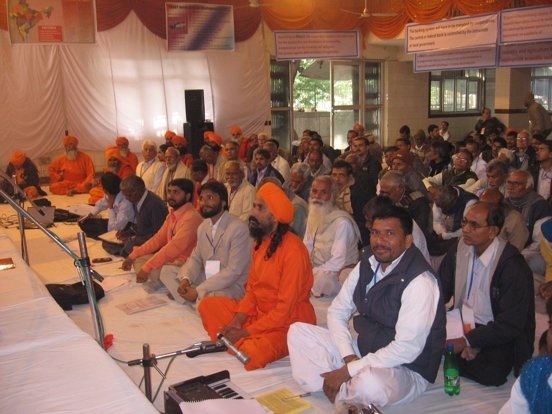 (November 2009) – The Global Prout Convention at New Delhi to celebrate 50 Years of deliverance of PROUT was inaugurated on Nov 20. More than 400 delegates and active cadres from all over India and abroad attended the three days convention. On the agenda were world economic instability and the changing international scene, the importance of local initiative/control and the role of spirituality in progressive socio-economics. Along with other experts from the various parts of the world, some of the presenters were Dr. Ravi Batra and Dr. Susmit Kumar. Dr Batra is professor at the SMU University in Texas, USA and author of several innovative, economic bestsellers and reputable critic of exploitative capitalism. Dr. Kumar is a seminal PROUT thinker and author. Mounting Food Shortages, Financial Crisis "Demand New Socio-economic System"
The downfall of both capitalism and communism is inevitable due to their inherent staticity. Both capitalism and communism are on the verge of extinction from this world. The contradictions in capitalism are due to the self-centred profit motivated psychology and the accumulation of wealth for the benefit of a few rather than for the welfare of all. Hence, capitalism is not congenial to the integrated growth of human progress. A day is therefore sure to come when capitalism will burst like a fire-cracker.